Last week we enjoyed a fun-filled time at the fair to celebrate my son Noah’s 10th birthday. We were all reminiscing about the fun we had as we entered the house that night, but something seemed strange as we walked through the door. Normally Noah’s little dog, Flower, greets us enthusiastically; usually barking, jumping up on us and waging her tail. The silence was deafening. We looked everywhere for her—upstairs, under the beds, even in the attic. She was nowhere to be found. My dad, who was visiting from out of town, recalled the door to the house being open for a while when he was outside working on a car earlier that day. Flower must have slipped out and run away. She is an adorable little five-pound Poochin (a mix of a toy poodle and Japanese Chin). And to say she is like a member of the family is an understatement. She’s been Noah’s “baby girl” for five years and is a very important part of home and our hearts. It was late and dark outside. Things always seem the bleakest at night. Our minds wandered to her being taken, or worse. We searched the blocks surrounding our house and called for her but eventually we had to go inside and just pray. It was Noah’s prayer that really got to us. He was very upset, of course. But he had faith. And he prayed very specifically. We all went to bed with lumps in our throats, knots in our stomachs and prayers on our lips. When we awoke the next day, it was as though there had been a death in the family. We got ready for the day in silence. My greatest fear was that Noah’s earnest, heartfelt prayers wouldn’t be answered in the way he expected. As we drove to school, however, I saw a handwritten notice scribbled on a piece of paper on a street post. 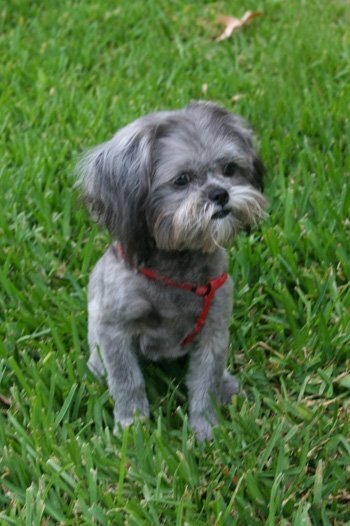 It simply said, “Found: small gray dog” with a telephone number to call. If you aren’t a dog lover it may seem silly that we were so distraught over our missing pup. But this was very serious to us. But more than anything through this experience I learned a valuable lesson from my precious son about faith. God hears us when we pray. Now, He doesn’t always choose to answer as we would ask Him to. But I believe that quite possibly we don’t see God move more often in miraculous ways in our lives not because He won’t…but because we fail to ask and then truly believe that He will. And by the way, Flower came home on Friday. Who said God isn’t concerned with the little details that matter to us? I heard a powerful story on the radio the other day that I wanted to share with you. Her mother smiled and reached into her purse when she was suddenly overcome with the feeling of generosity towards her child. Instead of pulling out a quarter, the mom retrieved a dollar and placed in her hand with a smile. The little girl responded with belligerence, “Mommy, I didn’t ask for a dollar. I said I just wanted a quarter!” So she snatched up a quarter and out the door she ran. She missed out on a blessing that was hers’ for the taking just like we do sometimes when it comes to the generosity of our Heavenly Father. God loves us so much that He wants to give us exceedingly, abundantly more than we could ever hope or ask for (Ephesians 3:20). He wants to pour out His immeasurable blessings on us and all we take is the quarter. If you are at a place in your life where you are asking for God’s help—whether it is with your health or weight-loss goals, your finances, or even your relationships—be ready to accept the fullness of all He wants for you. Don’t be satisfied with just a small portion when He wants to bless you in abundance. Just like that little girl, we have a heavenly parent that takes great joy in more than meeting our needs. I pray God will meet all your needs today and that you will let Him.